Publish And Be Damned - ZineWiki - the history and culture of zines, independent media and the small press. 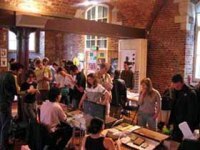 Publish And Be Damned is an annual independent publishing fair in London, United Kingdom. It has come to be regarded as an annual highlight in the global micro-publishing calendar. Publish And Be Damned was first held in 2004 and created by Emily Pethick and Kit Hammonds. This line-up now includes Sarah McCrory. The selected publications are allocated tables where they can display their work and sell from. The number of publications varies each year. The event itself has expanded in size and attendance since 2004. The types of publication featured each year include everything from zines and self-published books to newsprint titles and glossy magazines, all of which are independently published. Some titles are free while most are sold. Eligibility is decided by a panel made up of the founders and invited guests curators. An open call for submissions is announced in early spring each year. Details on how to submit publications are found on their homepage. The Publish And Be Damned Public Library is a travelling archive of past submissions to the fair. Each year sees new submissions added. Publish And Be Damned is funded by grants from various Arts organisations. Since 2004 the event has received support from The Elephant Trust, Arts Council, England, A Foundation, The Goethe Institute, The Polish Cultural Forum, Pro Helvetia and the Mondrian Foundation. The Public Library has received funding from amongst others the Cubitt Gallery, Tranzit, The Elephant Trust, Arts Council England & The British Council. 2004's event took place in The Crypt of St James' Church in the Clerkenwell area of London on Sunday 4th of July. More than 30 titles from the U.K. and Europe took part. 2005's event took place on Sunday 31st of July at the same venue as the previous year. 2006 saw a change of venue with the event moving to the Rochelle School in the Shoreditch area of East London. 2007 will see Publish And Be Damned return once more to the Rochelle School in Shoreditch, East London.